We frequently have fajitas and tacos on our menu. In the summer, it tastes so good to have fajitas with freshly grilled peppers and onions. Sometimes, I like to make the chicken ahead of time and freeze it. I use frozen boneless/skinless chicken breast tenders. I thaw them, allow them to marinate, and add them into the list of batch cooking that I’m working on. After they are cooked, I pop them in the freezer. Then, I just pull it out in the morning, and then while the tortillas are warming in the oven, I add a little bit of olive oil, and salsa and saute the peppers and onions…adding in the chicken at the end to warm it up. *Mix the oil, lemon juice, cumin, and garlic powder together and pour over chicken breasts. Allow to marinate for half an hour or longer. *Add the chicken and saute for about 3-5 minutes. *Add the remaining marinade, and continue sauteeing the chicken until it is almost done. *Add peppers and onions to the chicken and marinade, and saute until the vegetables are tender. **Serve in warm tortillas with shredded cheese, taco sauce, sour cream, etc. 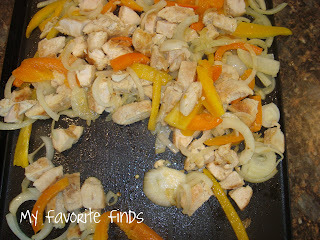 **The leftover chicken and vegetables are good in quesadillas or on a salad.